Okay i bought a really nice, one of a kind condition, 91 formula 5.0 TBI (115k miles) from an auction. Looks like it's spent most its time in the garage by the ocean, damp environment. Two days later, a slight hesitation or missfire and progressively worsened. Only when the engine temps are at full operating temp. and also always takes a while and I would have to drive 20 minutes before it begins acting up. This hesitation or cutting out or misfiring, whatever it is, only occurs during acceleration and is at its worse the heavier the load and now happens on the freeway in 5th under light load, but only when accelerating. I park it for 15 - 30 minutes, start it up and its running like half the energy is being sapped away from the coil, but running. slow throttle response revving the engine in park with some a little bit of white smoke the 1st second after engine start. 5 MPH crawl if I move from the stop. BUT HERE'S THE THING: it clears up to normal about 30 seconds later EVERY TIME. Again, only after reaching those hotter temps, this too happens. I have replaced it all, in this order >> (day 1: Wires, cap, rotor) >> (day 2: spark module) >> (day 3: coil) >> (day 4: fuel pump) >> (day 5: NGK v-power spark plugs). Heres the kicker! A friend replaced first 2 plugs on the front driver side before giving up and letting a mechanic with a lift continue the job minutes later. He did use a small cordless ratchet to slowly loosen the plugs and finally a ratchet / socket after they were loose and one plugs porcelain part broke in his hand he said. (old crack?). A mechanic shop down the street finished putting the new plugs in and says one wire was burned (I never fastened the wires when I changed them) he replaced that too, did a oil change to mobile synthetic. (some sludge oil build up seen behind oil cap, ill use the synthetic oil change as a flush anyway). Car runs perfectly normal and healthy for the rest of that day after changing the plugs. The next day im 10 miles into my trip running local errands before i start feeling a faint hiccup...then a while later agian another slight missfire...oh know it's coming back.... Then I park for 30 minutes start it up and SAME **** AS BEFORE WITH THE 1 WHITE CLOUD OF SMOKE & awful running engine for 30 seconds, then it's fine. I jump on freeway drive 5 miles , engine temps are at peak normal and BAM back to that bucking / jerking cutting out hesitation and its back and continually getting worse. Doesnt make sense to me. I thought, either the mechanic bumped a wire or......what else could of possibly let it run great for a day? Probably get flamed for this, but seeing as through youve gone through the easy stuff, whats the exhaust like? the crawling at low speed, poor running and crappy power are possibilities of a plugged/partially plugged cat or muffler. I had the same symptoms and chased everything you chased pretty much in that order before i dropped the exhaust just before the cat. I don't know how many times I've said this, i cannot remember, the way this stuttering hesitation misfire feels and, acts just like a 'wire' would randomly short out and arc. One important thing i mentioned was how it faintly returned and I barely felt it, at a bare minimum then progressively got worse. 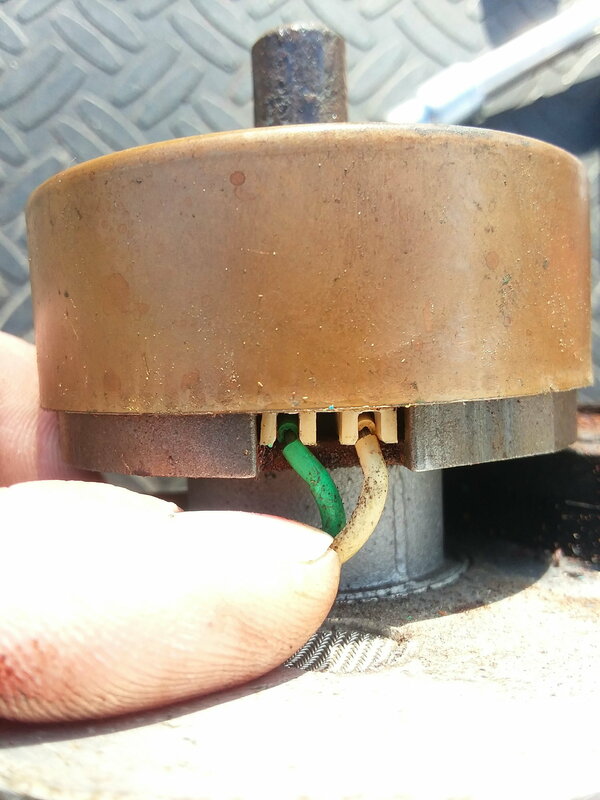 And when i replaced the coil i remember it took a little longer for the symptom to return just like this time just not as long which has meez suspecting something around that distributor. Arcing of ICM wires/harness inside of distributor. Did you replace the cap and rotor? and a new ignition control module (they are super sensitive to heat, mounted in the distributor) Cheap and worth a try. You also may want to add a extra ground wire from the base of the distributor to the engine block. The ignition module grounds through the distributor, and sometimes enough crud can exist so that the distributor body doesn't ground well to the engine. And make sure the coil etc is tightly mounted they can loose ground if just loosely mounted in. Did you say it smoked when it lost power? 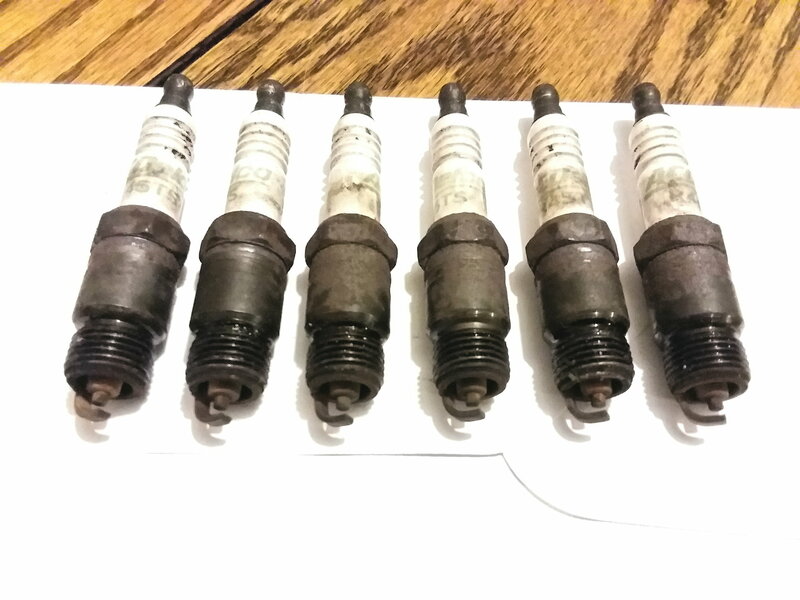 To me that sounds like you have a valve getting stuck open, though your old plugs above looked OK, but there is only 6, what did the other two look like? Also could be water from the coolant leaking into the cylinder (IE blown head gasket) that only shows up once the car is hot. Do a compression test and or a leak down test on all cylinders when the issue is repeatable. Or pull the valve cover and check the valve lash if you have one sticking it should be obvious. An Endoscope through the plug holes can also be used. Also drain your fuel tank when you have the filter out (it will self drain usually even if you don't want it to) put some clean fuel in and let that flush out any old gas. Run the fuel pump to get the last little bit that you can. Then put in about 1/4 tank with ethanol free fuel if you can get it. I would then add some good fuel treatment. With it have been setting you probably have a good bit of varnish and or rust in the tank. If you replace the icm, witch it sounds like it’s ignition related issue. It would be a good idea to pull the distributor and replace the pickup coil. setting the timing is done with the est connector unplugged this is located by the heater blower motor housing. A single connector tan with a black stripe. Timing spec is tdc. When you step into the throttle does the motor just stop climbing in rpm, or jerk violently or almost die? Have you changed the fuel filter? Did you replace the ignition control module inside the distributor? Get a fuel pressure gauge and take a reading at idle and then with it still hooked up go for a drive and check it while giving it throttle. I don't think this is an ignition control module issue since it is only occurring when you give it throttle. Should be able to rule out the ICM by unhooking that tan timing wire connector and advancing the engine to like 24 degrees. Leave the wire unhooked and try to give it some throttle on a short drive. I'm only talking a once around the block keeping it under 3K rpm. I'm leaning towards a fuel problem. Mate, considering you haven't yet managed to track down anything electrical after replacing all of those electrical parts, don't get pissy when someone offers you an alternative to electrics. You might also want to see if you can swap out a distributor with someone, the pickup coil in the bottom could be on its way out. Methods of testing them do exist, but the only conclusive result i've seen was when one shattered. If you're delving into the dist to try and diagnose this, you might as well replace the dizzy itself. Just did a 100 mile roundtrip, mostly freeway and I learned that, this only happens whenever the engine or the engine compartment is hot. If i keep it on the freeway keeping it running cool it doesn't do it. Even in traffic in the evening when with the cooler weather in stop and go traffic on the freeway and turn the fan on before the coolant temp rises too much it don't do it. But if i do let the temps climb a little i can feel the light electrical pulses cutting it out when I accelerate until the cooler air cools it down then it's good again . I meant the ignition control module ICM. Didn't know you can drive with while doing a fuel pressure test. It's only been done at idle when the shop replaced the fuel pump and was fine. I bet either a plug wire melted down there, again, since it did run good all day after the mechanic changed the plugs. The plug wires were only zip tied to keep them from getting spaghetti. Those plug wires very easily come contact with the manifold down there. If it's not that, distrib. Oh the other 2 plugs were the same condition. just forgot to retrieve them out of the dirt when they fell . Sorry for the trifecta reply im not use to this forums scipt they use here. I agree with Aviator857 . "Also could be water from the coolant leaking into the cylinder (IE blown head gasket) that only shows up once the car is hot." "Do a compression test and or a leak down test on all cylinders when the issue is repeatable. I thought about a coolant leak when reading your post due to the white smoke at start up. Compression test/leak down before throwing any more parts into the car. Change the ignition control module. It acts up when it gets hot. Wire a light up off the relay to pump wire and position it on you windshield wiper so you can see it and see if that light blinks off when it cuts out. Could be a re-burnt wire... if it is you really should secure those. If you want to do it cheap look up zip tie spark plug separator. Its a way of making one with zip ties that looks pretty cool when done right. Also the ICM seem to be hit or miss these days, I've seen several post where people had dead, or not serviceable ICM new. Make sure you use the heat transfer grease under the ICM, and like I said add a new ground wire from the distributor base to the engine block. Has the car always had this issue or did it start after you started replacing parts? It sounds like you have your fans on a toggle switch etc, how hacked is the wiring on your car? The other thought is the oil pressure sender is designed to keep your car running if there is oil pressure could you be loosing oil pressure either actually or the sensor going bad? Dumping alot of rain here in socal, haven't touched it yet. 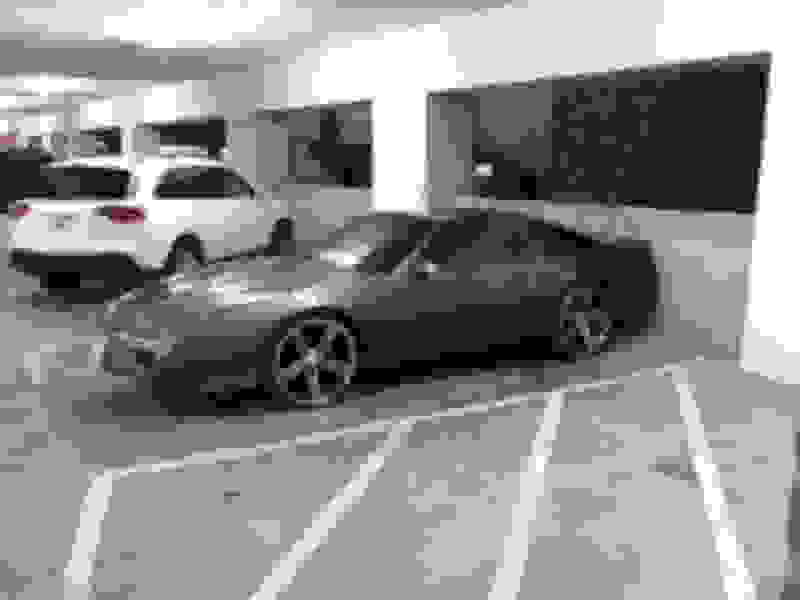 The single cloud of white smoke is just upon first startup in the morning and I really dont remember if I've noticed it any other time, like starting it after leaving it parked for an hour or two. I did hear about parts stores with bad ICM's. While im throwing new parts at it i kept thinking to myself, what if I did get a bad one... naaah not me lol. Remember, the problem went away when the mechanic popped the wires off and changed a few when he replaced the plugs. I doubt its icm. Last edited by okay; 01-31-2019 at 06:35 PM. White smoke is generally coolant burning. If you would like to continue getting peoples help on this forum, stop throwing parts at it and actually do some investigating. Don't just bury your head in the sand saying "nah nah i don't think its that"
Yes its a strange issue, but after all the new parts you've thrown at it you still have the issue. Time to put away the wallet and start some in depth troubleshooting mate. Where in socal are you located? Im in the IE. Smoke at start up is probably worn valve stem seals. When the car sits, oil runs down the valve stems, then at start up oil is burned. Looks like a white/gray color. As the oil gets hotter and thinner works its way down into the cylinders. Also causing fouled plugs. This is why a new set of plugs correct the problem temporarily, until they get fouled. the combustion chamber. Age means nothing! If the white smoke is bugging you then maybe you might want to fix that and then by doing so you will remove that from the equation. You could start by removing the intake manifold (Easy Peasy), inspect it (Take pic's and post them) and/or send it out to be crack tested, replace the gasket between that manifold and the heads. OR go all the way and do the same to the heads as well. What does your coolant look like? How does the engine temp seem, normal? Any bubbles visible if you remove the radiator cap and run the engine after it is up to normal temp where the thermostat is open (Be careful and don`t get burned)? Is your coolant and oil level stable/consistant? What does your engine oil look like? If milky looking that is typically indicative of coolant going where is not supposed to go. Or your issue may not be related to that relatively short bit of white smoke. I`d recommend cheching out and eliminating causes that were suggested above. Many members here have Huuuggee amount of experience and awesome skills. You`ll find no better resource IMO. All the best and happy troubleshooting! Im in Ontario. I can look at it and better help diagnose it better in person one of these days. That is cool man I'll pay for your time, too. ill pm you my number. UPDATE 》》 New distributor going in now. Here's what the two pick-up coil wires look like inside the old one: looks like both wires are broken exposing the wiring for some possible arcing! Oh, and that puff cloud of smoke i was talking about whenever I'd park and sit for 30 minutes before starting back up, the smoke is actualy a blueish color (fuel). Remember, i also said that when this happened it ran like it had shittgas until it cleared up 20 seconds later..
Last edited by okay; 02-16-2019 at 06:09 PM. Bluish smoke is typically caused by burning oil. Look at valve seals first and for à leaky intake manifold gasket between the ports and thè lifter galley. After that consider the piston rings. even if is not now it may down the roád. Get a new connector with pigtails and splice in. Because today was the warmest day the "engine bay" temps were higher then any of the previous days since I put the new distributor in. Nothing hot at all, still normal coolant temps, but i actually had to turn the fan on today. With the colder weather these past days the coolant temp gauge wouldn't even pass the first quarter mark if I tried. As soon as i let the coolant near the 180+ and drive a while like that, and the engine bay is hotter, the bucking cutting out jerking hesitating whatever, returns! Obviously theres probably a intake manifold leak with the oil leak. Might even be the new spark plug wires getting burned on the exhaust when the mechanic zip tied em together. New wires go on tomorrow. 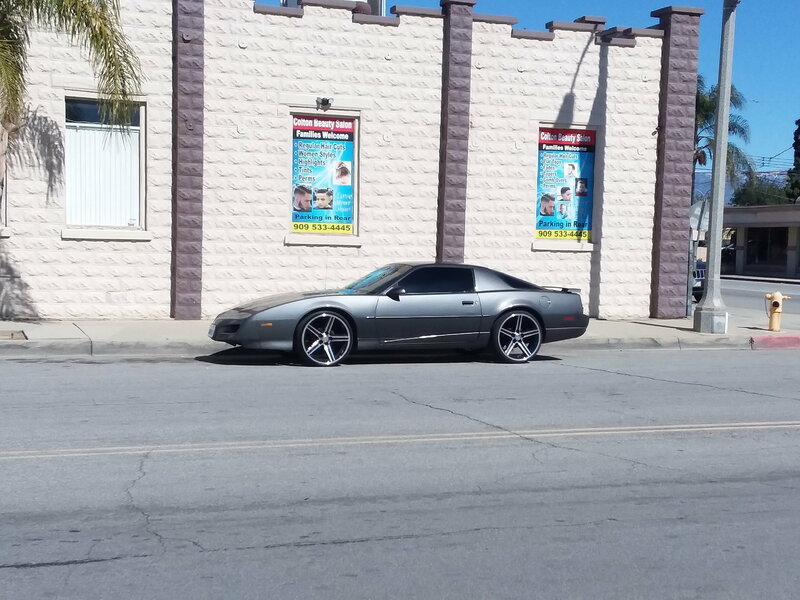 I took this picture today..
Those rims look similar to the stock ones on my IROC-Z. Where did you get them and what are their specifications? Maybe you have a link to share? Before applying new paste make sure all contact surfaces are completely clean and any mounting hardware (Bolts/Screws) are also clean and rust free. Also insure the dizzy is well grounded. Your idea to repace the spark plug wires is a great idea. I have had excellent performance from my Taylor 8mm Spiro Pro`s. Thanks Tim! Those are just iroc 22" replicas. Tires are 30 series. 1200$ total. Sucker grips on the freeway though with the low profile tires. Unless I know the road, i take a very slow. Been a real battle trying to light up the road at night so I can see. Just put HID headlights in. It's different thatsfor sure. Everybody wants to show me they have when they drive by me like they wanna race me....because it 'looks' fast lol. People are retarted if they think im fit to race with 22" rims lol. I so badly wish though, that I had an LS something under my hood so I can put em away all day long. The new distributor came with a new ICM already attached. You just reminded me, the grounds. When i put the new coil in i didn't see any straps..
Last edited by okay; 02-20-2019 at 02:45 AM. Did you ever check or replace the engine coolant temperature sensor? Since this is a temperature related issue. Wow, Thanks for the new pic. I really do like those wheels. I think I need re-read the entire thread. Maybe I`ll come up with something new but I`d like to see if the new plug wires help. Also, are you pretty sure it is underhood temp related or just when it goes into closed loop? Relates to a good point made by 3.4 grape regarding the coolant temp sensor. One more thing, just because your distributor is new does not mean it could not be faulty. I`ve bought new parts before that were DOA, intermittent, or short lived. Based on your comments about turning on the fans... This issue seems to show up when hot, and you seem to have your fans on a toggle switch. Two things come to mind. Are you pulling power from something you should not be to run the fans? Are your temp sensors functioning correctly (there are two), and if so why are the fans on a toggle switch? I've seen people drive the fan relay using a random 12v source that turned out to be the 12v to the ECU and cause all kinds of random issues. If wires don't fix it and it's not the above. And you have verified block to body ground straps are good... I'm afraid I would start looking at mechanical, rings, valve seats, etc. May be worth the money to get a shop to diagnose it, vs throwing more parts at it. I did not wire the fan up so I don't know if this is the way it's supposed to be wired, my fan can be triggered ON by the a/c. Fan also comes on at 200f which is way too hot for me. I'm going to change wires out now. Are you getting any pressure built up in the fuel tank? I know it hasn't been all the hot lately. Your problem could be too much fuel tank pressure causing fueling problems. Also another area to consider is the fuel pressure regulator in the TBI unit. Your fuel also gets heated up when it returns to the tank and if your diaphram in the regulator is tired once warmed up you will lose pressure and cause bucking as well. 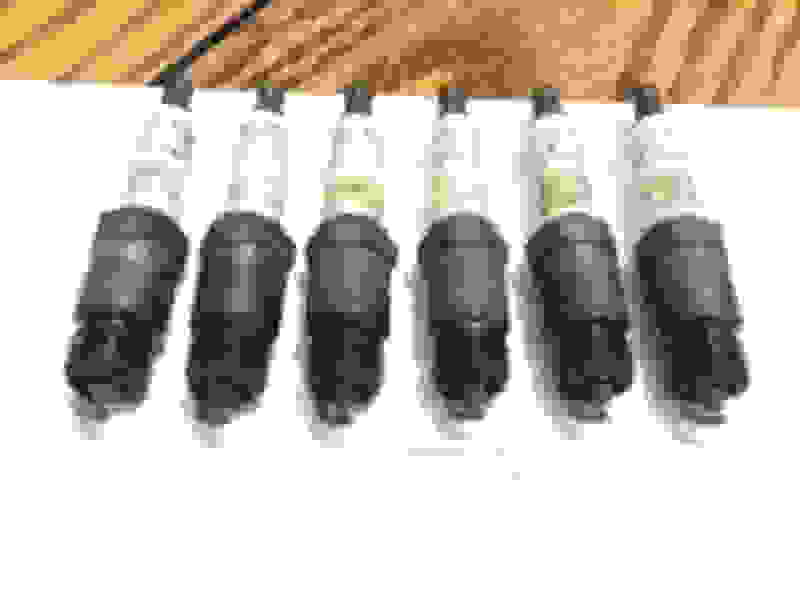 Ohm out the injectors also. Check them Cold then again after warmed up to make sure they aren't failing. I haven't had much time lately with race season and work to contact you. I had fuel pressure regulator in my head weeks ago and totally forgot about that! I was telling the halfassed mechanic it may be the regulator when he did the fuel pump. Then they pissed me off and i lost my mind off when they ripped me off, adding another charge for "wiring the fan the correct way: to the a/c", which was already wired that way to begin with. Got my new wires today, bought the Pep-boys brand for $27 and then stopped myself from putting that **** on. Instead i bought Accell 8.8mm wires for $78. Going on tomorrow....so we'll see. My friends been on my *** about my idea of keeping the car is not a good one they claim. 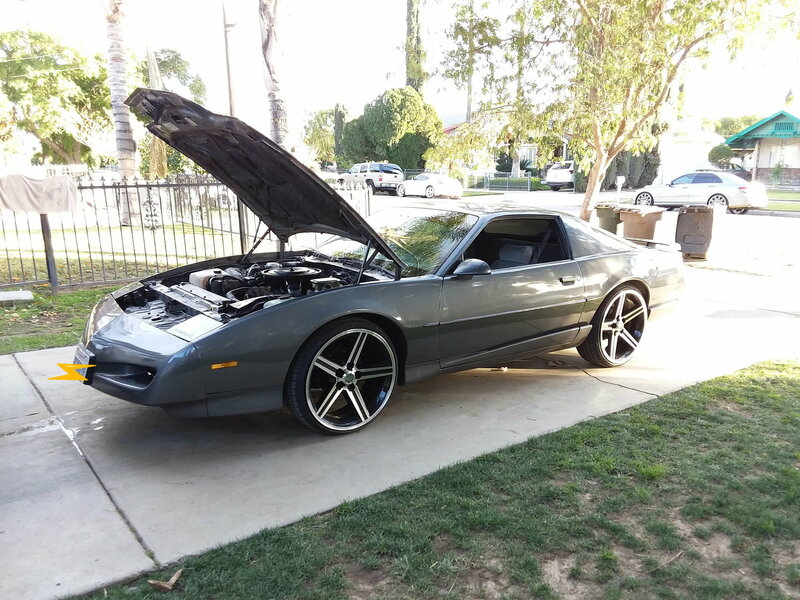 They say its gonna be a money pit and that ill be doing tune-ups every month or two! I kinda disagree. Parts last a lot longer then that! ****, i kinda think these cars are more dependable then some of the cars on the street today! Okay one thought -- have you replaced the PCV valve? Its a long shot but since its like $5 might as well replace it. If its clogged you could be building too much crank case pressure. Also I have the ecu and the TBI module off my 89. I rebuilt the TBI module back in 2015-2016 time with new gaskets and new injectors... since I've gone LS1 its just occupying space on my shelf. If your interested in buying it PM me with where you live, if I can find them I'll include the original injectors also I replaced them because they were sticking on start up and it was hard to crank. The engine had 212kish miles on it when I pulled it, I sold the engine to a member here for core cost, though it ran fine. so you have a proper test port for fuel pressure. Then hook up a fuel tester and zip tie it to your wipers or something and drive it around until it starts having issues and see what your pressure is doing. Autozone also has a TBI fuel pressure tester that comes with a adapter that goes between the hard line and the TBI, but that one isn't designed to leave in place and is a PIA to install. One other question what brand is your new fuel pump, the fuel pump is one item I will never buy parts store brands on? Check your fuel pump relay and pig tail I had to replace mine twice over the years because the pig tail melted, Often seemed like they were not quite up for the voltage draw. If the pigtail is good, the relay is the same as the one for the blower motor (heater/ac) so you can swap them and see if the problem moves. Another long shot is -- voltage if your battery has an internal issue it could be dropping a cell when its hot and your voltage could be dropping below what is required to run the car correctly. Again easy to test hook a multimeter up to a 12v inside the car and monitor voltage when its misbehaving. An even better spot to test would be the 12v at the distributor, the 12v at the fuel pump relay etc to see if possibly not the entire car having voltage issues but a single circuit. You did replace the fuel filter, and the shop that did your fuel pump they did replace the fuel sock in the tank right? And you have at least 1/2 a tank of fuel right? watch this its TPI and a vett but its the best I've seen on the step by step diagnosis. It did remind me to suggest ohming out your injectors in the TBI once the car is hot and acting up. I recommend adding something like this https://www.amazon.com/Tool-Aid-3765...gateway&sr=8-7 so you have a proper test port for fuel pressure. Then hook up a fuel tester and zip tie it to your wipers or something and drive it around until it starts having issues and see what your pressure is doing. Autozone also has a TBI fuel pressure tester that comes with a adapter that goes between the hard line and the TBI, but that one isn't designed to leave in place and is a PIA to install. Thankyou for your help! I haven't changed the pcv yet so ill get one of those. I gave the both the fuel pump and screen to replace, yep. Fuel level never made any difference. One thing i noticed last week pumping gas, the gas was overflowing out of the spout and force stopping the pump early and i thought it was a problem with their pump until I read somewhere about other firebirds doing that same thing. And this happened only 1x. And I only pumped 10$ or 15$ that time. Tank was low, too. A few times releasing the fuel cap released pressure. NEW Accell plug wires are on. I feel an increase in responsiveness and idle is a lot smoother. I'll get the motor hot tomorrow and see what's up.. Still doing it. Does anyone know if using the data logger while driving will tell me where I need to look? And Tuner Pro R/T software to help. What you want for the tbi? $30 + shipping? I would do ground shipping since it's a used fuel item. I'll throw in the distributor complete minus the cap and the old ECU for $20. What state/zip are you in? The ECU swap right in? ill take the TBI and the ECU. I don't need the distributor. I live in southern California. Last edited by okay; 03-07-2019 at 05:06 PM. Blue smoke is typically due to oil in the combustion chamber. On startup, some call this the "Chevy Salute". Typically indicates worn out valve seals or bad piston rings but could be due to other issues like an intake manifold/gasket problem. Black smoke and excessively sooty exhaust pipes/tips is typically an indication you are running rich. White smoke that may be acompanied by a sweet smell is typically coolant in the combustion chamber. Checking for a blocked exhaust and/or clogged cat is an excellent idea. Awesome that zed-028 mentioned it ! Oh i hear you im hoping your right! While im at it, there's aint gonna be any restriction after im done with it! Ive driven cars with clogged cats and its usually just slow as you accelerate then would catch up on deceleration. My symptoms are bucking.. feels like the entire ignition spark from the coil is being cutoff. or fuel is being shut down, all this happening instantaneously, sporadic the hotter the engine bay or engine gets. If i let the coolant temp reach 200 and and let it hang around in the range of 200-210-215 degrees for a good while, this problem begins until it cools down in there, like some freeway driving. Just recapping incase anyone missed something I said. I'm sure you and everyone else here already knows, I'm not doubting anyone here at all. I need to find a pro GM tech with the ability to scan / troubleshoot while this is occurring. Last edited by okay; 03-10-2019 at 10:25 PM. This coughing went on for about 2 months... one day it coughed and wouldnt start, i replaced every part you have, i also wound up with 2 carb fires caused by it backfiring out the carb and igniting fuel. Wasnt until i dropped it after the (empty) cat, wiped off the plugs and kit the key that i realised the issue was exhaust related. Just goes to show you dont need a full blockage to mess you up. Think of trying to breathe when running with a piece of bread lodged in your throat. also beware of the sound that will come out of this thing with the exhaust off, you will be unpopular with the neighbours. 22 years ago I had a '85 coup de ville that sporadically cut out the same way my formula is. Except temperature wasn't the trigger, it happened at low rpm accelerating from a stop. Clicking noise inside the passenger dashboard. It was the fuel pump relay. Very similar almost exactly what it feels like, except its not a bad relay. I forgot to say I had a new flowmaster put on last week. I'll get the cat looked at tomorrow for sure, man.